In order to remove a wisdom tooth, a dentist first needs to numb the area around the tooth with a local anesthetic. 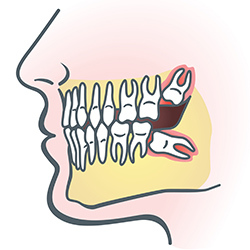 Since the impacted tooth may still be under the gums and embedded in your jaw bone, we will need to remove a portion of the covering bone to extract the tooth. In order to minimize the amount of bone that is removed with the tooth, Dr. Walk or Dr. Bamel will often “section” your wisdom tooth so each piece can be removed through a small opening in the bone. Once your wisdom teeth have been extracted, the healing process begins. Depending on the degree of difficulty related to the extraction, healing time varies. Our office will share with you what to expect and provide instructions for a comfortable, efficient healing process. If you are interested in learning more about Wisdom Teeth Removal, contact our office at 617-965-7673 to schedule a consultation today.